The program continued with selections from the Hamlisch soundtrack for “Sophie’s Choice.” It was a tender and embracing score, and beautifully displayed the extraordinary talents of HSO. Next on the bill was a tribute to Richard Rodgers. It included a sumptuous and exotic “Bali Ha’i,” (under rose-colored spotlights), an “Oklahoma” that was bursting with joyful energy, a “Lady is a Tramp” full of bounce, and a soft, caressing “With a Song in My Heart.” Handsome tuxedoed soloist, Steven Leahy, gave the audience more Rodgers hits beginning with a smooth, almost operatic rendition of “Hello Young Lovers.” He followed that with a delightful “It Might As Well Be Spring,” that was perfectly controlled. With swinging backup from the orchestra, Leahy delivered a foot tapping, high energy “This Can’t Be Love.” Then, in a sudden downshift, he offered a gentle and tender “Some Enchanted Evening,” which rose to such heights that it caused unfortunate distortion from the microphone. Audio problems continued as Leahy, never the less, gave a resounding, and well-received performance of Andrew Lloyd Webber’s, “All I Ask of You,” from Phantom of the Opera. Then followed a comic segment in which I unexpectedly played a part. 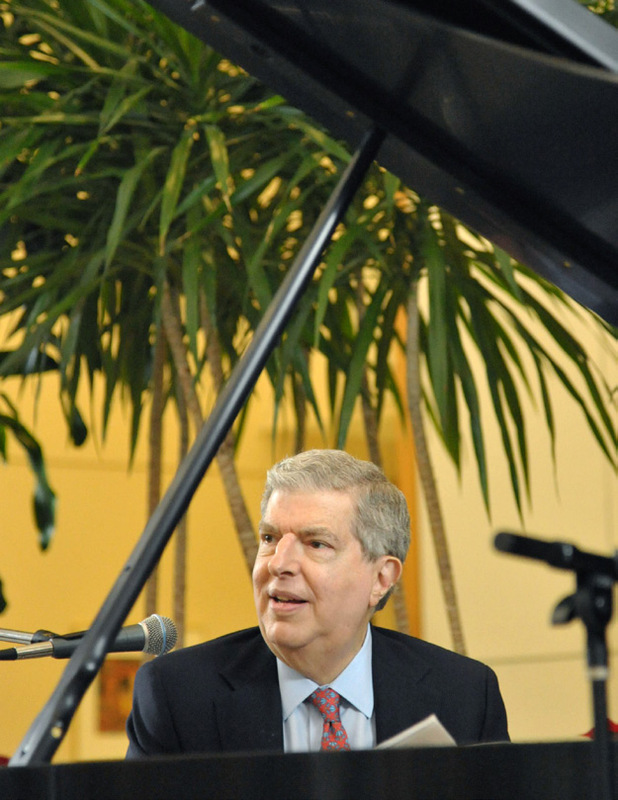 Hamlisch asked the audience to call out song title suggestions so that he might select one to use in composing a new tune from the stage. Having watched him suffer in the Houston heat, I violated the traditional critic’s low profile, and called out: “Houston Summer Night.” The composer wasted no time in taking my idea to the keyboard, where he quickly put together a forgettable, but witty lyric, that closed with the line: “How I hate to concertise when the Fahrenheit is 1-0-4!” The audience roared with laughter. The highpoint of Act II was the composer’s performance of “…the Overture that A Chorus Line would have had, if it had had an overture.” It seemed to contain all the wonderful songs from Mr. Hamlisch’s Pulitzer Prize winning Broadway show. I was especially moved as I listened to the beautiful “What I Did For Love,” and recalled how, a quarter of a century ago, many of the sixth grade girls in my charge would cry whenever we rehearsed the touching song for our graduation performance. I think I have finally caught up with their sentimentality. This entry was posted in Broadway, BroadwayStars.com, Concert Reviews, ThePeoplesCritic.com and tagged Broadway, Celebrities, concerts, Cynthia Woods Mitchell Pavilion, Houston Symphony, Marvin Hamlisch, music. Bookmark the permalink. I just heard of Mr. Hamlish’s death on Monday. The universe has lost one of the brightest stars. Rest in peace, Marvin.